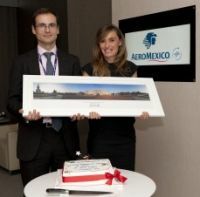 Just before the holiday break Aeromexico introduced their much anticipated three times per week service non-stop from Heathrow to Mexico City. For the first time for some years British Airways will face competition to one of the eight largest emerging markets in the world. 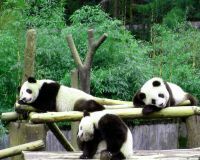 As part of celebrations to introduce new services to Seoul (using slots acquired with the bmi takeover) BA announced just before Christmas a new route to Chengdu in South West China. The thrice-weekly service, which is now on sale, will start in September. 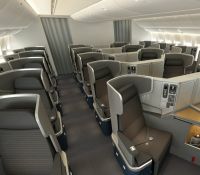 The route will be served by a four-cabin Boeing 777 with First, Club World, World Traveller Plus and World Traveller. British Airways already serves Beijing, Hong Kong and Shanghai in China. British Airways has always been an airline with children in mind. 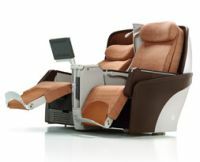 Someone, a long time back, recognised that the child traveller of today could be the Business Class passenger of the future. Following a successful trail last year London City Airport (LCY) and British Airways are expanding self-bag-tagging facilities for passengers checking in via the self-service kiosks. Loganair is to introduce a weekday return service to Dan Helder in Holland, via Norwich, from 4 March. Dan Helder is the centre of the Dutch offshore North Sea oil and gas industry, and the most northerly point in the country. It is about 60 miles from Amsterdam. Germanwings, the domestic division of Lufthansa, has started to introduce a new colour scheme for its aircraft fleet. 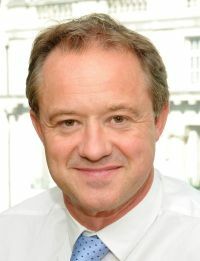 Andrew Haines became the first Chief Executive of the Civil Aviation Authority (CAA) in August 2009. Previously the post was called Executive Chairman. 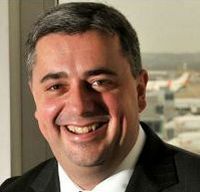 Mr Haines joined the CAA after a wide-ranging career in the rail industry. He quickly became what Flight International would call “a total aviation person”. He is seen very much as a ‘hands on’ CEO, a visible contact between the industry and the legislators. Business Travel News likes to pride itself with a worthy COMMENT introduction to the New Year. Mr Haines' words affect us all and should be carefully considered. 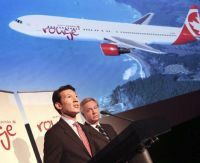 A new leisure airline has been unveiled by Air Canada and with it a summer service from Edinburgh to Toronto. The plan is to offer three flights per week from 3 July to 18 October 2013. “Air Canada rouge” was the name chosen. Filton Airport Bristol has closed. Business Travel News thought it had closed the book on the Concorde disaster 25 July 2000, publishing on 3 December a short review of the French appeals court pronouncement absolving Continental Airlines for the September 2000 crash. A cover up looks like it might have taken place. Could the same be the case for AF447? With the Airbus A330 there are 900 currently operational. 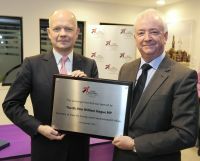 Coinciding with the announcement that the Tour de France is to start at Leeds in 2014 William Hague, Secretary of State for Foreign and Commonwealth Affairs officially opened Leeds Bradford Airport’s (LBA) £11m passenger terminal development just before Christmas. Mr Hague is MP for Richmond, North Yorkshire. The Financial Times published an article on 30 December by Andrew Parker and Rose Jacobs, the result of an interview at which he espouses the virtues of a future three-airport London hub, with Gatwick, Heathrow and Stansted each having two runways. In a practical sense this would work, from 2020 onwards, as the land is secured, although the planning process would have to be dealt with. The real problem is that the long haul airlines are not keen on Gatwick (and even less so with Stansted) (see Korean Air above). If a base carrier (Middle Eastern perhaps) were to come in at either airport it might change the position. The ownership of Stansted is not yet resolved. 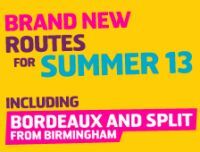 Based at Luton, and Swiss-owned, Monarch Airlines continues to expand as a mainly scheduled leisure airline. New for summer 2013 is Birmingham to Split, Croatia’s second largest city, and also Bordeaux, a World Heritage City. Split will complement Monarch’s existing Croatian route of Dubrovnik from Birmingham. The new services will both operate three times a week from 22 May 2013. Still trading in bankruptcy (Chapter 11) American Airlines has taken delivery of its first Boeing 777-300ER. The Welsh Government has proposed buying Cardiff Airport in order to improve its fortunes after passenger numbers nearly halved. Xian, home of the world-famous Terracotta Army (and for Rolls-Royce in China too), is to be connected to Europe for the first time next summer with non-stop flights by Finnair from Helsinki. The airline plans three frequencies per week on A330-300 aircraft starting 14 June until the close of the summer season on 26 October. Starting this month Iberia plans to start totally remodelling its long haul Business and Tourist Class seating arrangements, which includes bringing in new Airbus A330s. The initiatives are part of a “Transformation Plan” announced in November involving substantial improvements to all services, new aircraft, and redesigned cabin interiors on long haul routes. It looks like Gatwick Airport will lose its three times per week service to Seoul with effect from next Sunday (13 January). The route was due to be suspended from that date but it is not in the summer programme just published. Nothing has been confirmed by the airline. Transaero is moving a whole bunch of services at Domodedovo to Vnukovo with the start of the summer season. These include Frankfurt, Heathrow and New York JFK. This means all Transaero’s North America services will be operating from Vnukovo with flights to Los Angeles, Miami and Toronto already established. Introduced just before the Christmas holiday period United Airlines has begun a daily nonstop service between its hub at Chicago’s O’Hare and Monterrey (Mexico), and also Washington/Dulles to San Salvador. Opened just before Christmas is the upscale, newly constructed, 210-room Wyndham Istanbul Kalamis Marina, located on the Asian coast of Istanbul. 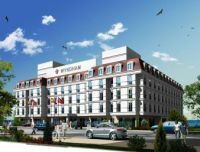 Wyndham plans to welcome its second Turkish hotel, the 306-room Wyndham Istanbul Petek, in summer 2013.